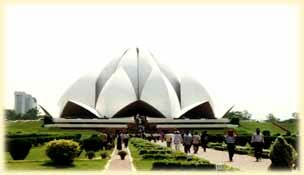 The Baha'i Temple or the Lotus Temple is situated on the top of the Kalkaji hill in the South Delhi. This temple has been categorised as the 'Taj Mahal of the 21st century.' This temple was constructed in 1980-81. This temple is one of the latest Baha'i temple in India and joins six other Bahai temples around the world.This temple is built out of white marble and in the shape of a half opened lotus flower. In appearance it is reminiscent of the Sydney Opera House. More than 50 million people visit this temple, making it the most visited edifice in the world. This temple was open to public in December 1986. It is a very remarkably striking building of simple design and brilliantly executed. 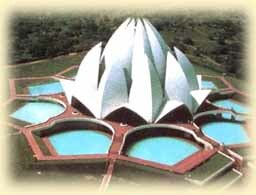 This temple is the Asian headquarters of the Bahai faith. This distinctive lotus shaped marvel in marble is surrounded by a landscaped garden and is a symbol of peace. In the construction of this temple several traditional Indian means of construction were employed together with the most modern Western engineering design. Fariborz Sahba, Canadian architect of Iranian origin with the help of a team of about 800 engineers, technicians, artisans and workers brought to realisation one of the most complicated constructions in the world. This temple is made of marble, cement, dolomite and sand. The temple is 34 m from floor to apex, 70 m in diameter, with a seating capacity for 1300 worshippers. 45 lotus petals form the walls and 9 pools surround the building. The nine pools on the elevated platform signify the green leaves of the lotus. These pools are not only an attractive feature of the temple but also keep the building cool. In the Bahai faith, the number nine represents unity. The lotus shaped structure has two layers. One layer comprises of the nine white marble-covered petals that point to heaven, and the other layer comprises of nine petals that conceal the portals. In the interior of the temple there are no religious icons, just copies of the Holy Scriptures and wooden pews. In this temple through prayer and meditation the people develop their strength of character and sense of discipline. It was not only difficult to align, so as to produce accurately the complex double-curved surfaces and their intersections and the closeness of the petals severely restricted the workspace. The task was not carried out entirely by the local labourers but each and every one contributed in its construction. To avoid construction joints, petals were concreted in a continuous operation for approximately 48 hours. Concrete was carried up by the women bearing 50-pound loads in baskets balanced on their heads. All the steel reinforcing for the shells of the lotus petals was galvanised to avoid rust on the white concrete in the prevailing humid conditions. The lotus flower signifies purity and peace, a representation of the Manifestation of God, to the people of India. This ancient symbol has been given a modern and contemporary form in the structure of the Baha'i temple. This temple is an ideal place for meditation and to obtain peace and tranquility. Bahai faith believe that prayer and meditation are the two important instruments for the progress of the human soul, both in this world and the next. The act of praying is described as 'Conversation with God' and meditation is perceived as the 'Key for opening the doors of mysteries'. The main aim of the Bahai Faith is to unite the hearts of the people and bring them closer to their Creator. The Bahai Faith believes in oneness of God, oneness of religions and oneness of mankind.